I keep an electronics test bench and I love repairing old radios or building other electronic or amateur radio projects, usually late at night listening to shortwave or talking with other hams. My Amateur call sign is KM5Z. After the success of the FM Stereo Broadcaster, I decided I’d like to have a proper antenna for it – rather than the usual ‘piece of wire’ hanging out the back. A collapsible whip antenna – Radio Shack offers a few. Simple, cheap, but not what I’m looking for. A Ground Plane – nice, but the ground-plane takes up a lot of space. Arrow Antennas will cut one for a specific FM Broadcast frequency (GP Custom model). A Yagi. Great if I’m trying to send in one particular direction OR increase the effective radiated power in that direction – a no-no, given FCC rules for Part 15. Ramsey Electronics offers a TM100-Tru-Match FM Broadcast Antenna Kit(PDF) for only… $69.95! I like that one – it’s a real 3-meter, folded-dipole and is mostly ‘flat’, except for the PVC housing. I like the appearance of the TM100 and it doesn’t take up the space of a ground-plane. So our new antenna will be the TM100 – but wait: the cost ($70.00 + shipping) is a bit high for what’s in the box. If you live where you don’t have DIY resources this will have to do; but, perhaps we can do better. A length of 300 ohm twin-lead, typical: Radio Shack 15-1175 (100 feet), about $18.69. A 75-to-300 ohm balun (transformer). A 3′ length of coax. A Ferrite choke core – ostensibly to keep any transmitted RF from reflecting back to the transmitter on the outside of the coax. Some bits of PVC to provide the “fancy” enclosure. Eh, call it a Radome if you like. Most of the parts are things I already have on-hand. But let’s do a cost analysis if we had to buy everything. Various Antenna Bits – I had several VHF baluns in my cables, cords and wall-wart box, but I bought another Balun for about US$2.75. Twin-Lead: I have a factory-supplied, 300-ohm twin-lead, probably provided with some FM receiver I bought years ago. Estimated $3.50 if you had to buy one. It measures 57 inches and that should work and will allow me to trim for the middle of the FM Broadcast band. 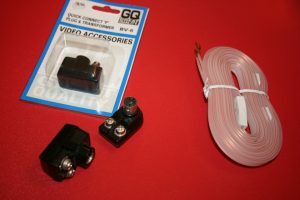 Balun for 75-to-300 ohms: Ditto – from my big box of antenna / connector / cable / wall-wart bits in the garage. Free to me, but I actually priced one at Fry’s for $2.75 (see above). and had quite a bit of coax radiation, so I opted instead for 75 ohm RG-59U. Again, free to me, but probably around $3.00 and you’ll have several feet left over. A trip to Lowes provided the 1″ PVC bits (about $5), and Altex supplied a panel-mount “F” connector $0.95). Not listed is a ring-mount, solder-tab to fit the “F” connector: we’ll have to solder the coax shield to something, since PVC is non-conductive. I think it was $0.10. 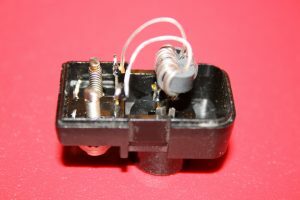 Crack open one of the ‘Quick-Connect “F” Plug and Transformer’s and you’ll find a little 300-to-75 ohm VHF balun. The tiny transformer can be clipped out of the plastic case (above) and used inside the FM-Antenna’s PVC enclosure. Solder the TwinLead Antenna to the left-hand side of the above transformer. Then note which pin goes to center and shield of the coax-side and solder to the 75-ohm coax. So, with a little PVC glue and some fender washers thrown in the TM100 Tru-Match FM Broadcast antenna can be cloned for about $16.55. 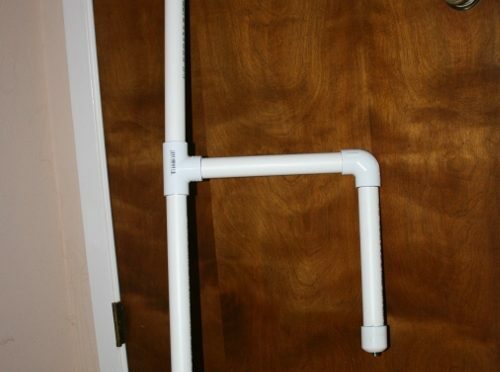 My Cost is quite a bit less since I had most of the parts on hand: about $6.05 for 10-feet of 1″ PVC, three caps, one “T”, one “Elbow”, a panel-mount “F” connector and a solder-tab. Ramsey provides the PVC tubing in short pieces (10″ or 12.625″ pieces), so we’ll come out a bit ahead not having to use couplers to join small pieces and the final result will be just a bit tidier. I’m guessing the reason for this is to get the product small enough for shipping. Not bad — and for the cost, the darn thing will be rather impressive to look at. So, since anything worth doing is worth over-doing — Let’s clone that antenna! This formula will give us the length of the antenna, end-to-end (as folded), for a given frequency. Since a Folded Dipole has a relatively good bandwidth we’d really just like to put the tuned length of the antenna in the center of the FM band, since the FM Stereo Broadcaster will probably not be set to a single frequency, will probably move to different frequencies to avoid nearby strong broadcast stations or localized noise. But experimental measurements (at least for my materials and configuration) indicated that possibly, my OEM Twin-Lead was a bit too long. I started with the OEM length, 57″ (or 28.5″ each side) and this seemed to peak at around 90.3 Mhz. This could be due to additional capacitance in the setup or some other vagary in the makeup of the materials. Your mileage may vary. I shortened the antenna by about 1.5″, or about 3/4″ at each end, making the new antenna 27.75″ on each side or 55.5″. I found the new length appears to peak at around 101 Mhz. Finished Product is Identical to the Ramsey TM100 – a Clone! Any mistakes are probably my own. This project is not guaranteed for any specific outcome or purpose. Warning! If you intend to mount the antenna outside, please pay attention and do not locate the antenna near overhead power lines or other electric light or powered circuits, or where it can come into contact with any high voltage. Also: Anything mounted outside, on or above a roof, should have a lightning protection system, such as an in-line spark-gap and a coax shield ground, bonded to house electrical ground (as per National Electrical Code). NEC Article 810 (A) thru (K) covers radio transmitting and receiving equipment and is intended to prevent (or reduce) voltage surges caused by static discharge or nearby lightning strikes from reaching the center conductor of the coax lead-in. I cannot be held responsible for illegal uses. This project is solely for educational, hobbyist, and experimental purposes. 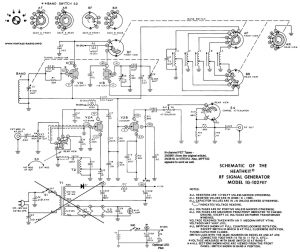 Please check your local (and national) regulations regarding unlicensed transmissions. FCC’s Part 15 Regulations are recommended reading, particularly Bulletin 63 (October 1993) “Understanding the FCC Part 15 Regulations for Low Power, Non-Licensed Transmitters”. 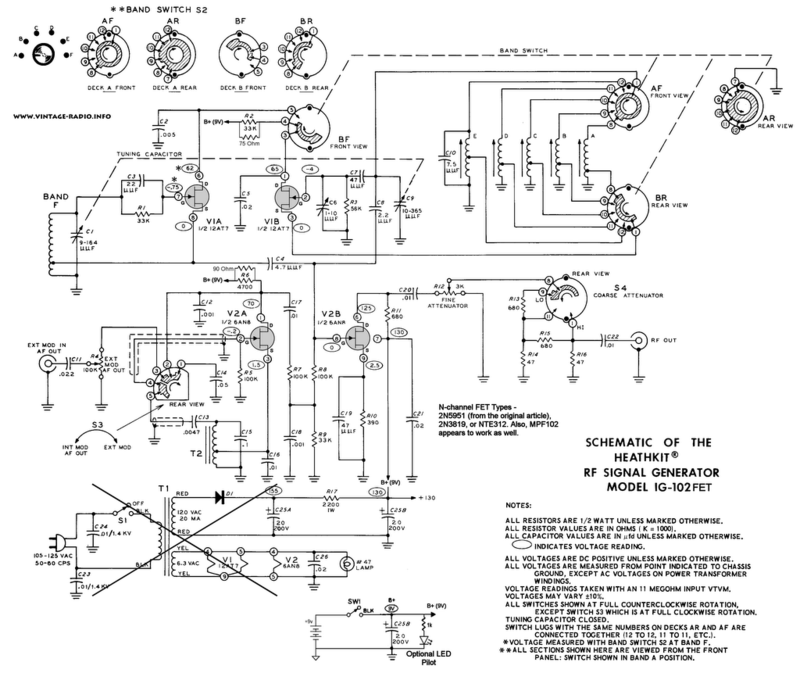 This project describes an “Intentional Radiator” and as such (operating in the band 88 – 108 Mhz), according to Section 15.239 (b): “The field strength of any emissions within the permitted 200 kHz band shall not exceed 250 microvolts/meter at 3 meters.” Using their calculations, this works out to about P = 0.3 E2 watts (where E is field strength in volts/meter), or 0.3 x (250 x 10-6V)2, or 0.3 x 0.0002502, or: 0.00000001875 watt (.01875 μ-watt). 3 August 2010 — Updated ‘typical’ Twin-Lead Calculations, including a Velocity Factor for Twin-Lead. My B+K 1435 Oscilloscope went down over Thanksgiving weekend. Really, it went down – it fell against my chair (I shouldn’t keep it propped up like that, I guess). However – the “A” channel input went bad. I took it all apart – screws everywhere on the carpet. I was so close to parting it out then W5AAN (Ginger) urged me to keep trying on fixing it. Turns out these old scopes are old-school. The traces are nice & wide and the parts aren’t surface mount (SMT). I wound up fixing a total of three problems with it. The pot for the “A” channel vertical positioning had two broken traces right near the pot. I was able to easily scrape and short ’em with a bit of component lead wire. Soldered those on and it worked just great. Got it all back together and found that now the “B” channel didn’t work. Well by this time, I know where everything is – opened it back up and the lead to the center conductor on the BNC connector had broken. Soldered THAT back into place and now the scope works great. It works so well I’m considering buying some new Gel batteries for it – it’s a portable model and while it was all apart, I tested the charge circuit to be working.